Data entry fields may be different for custom exercises. For example you can add angle and weight. START the exercise timer to automatically record the correct start time and duration. You do not have to enter “from” and “to” times first. If you want to do this exercise for 10 minutes, for example: enter 10 minutes into the third field and tap START. If you do not know for how long you will be doing this exercise – do not enter anything, just tap START. The duration is used to calculate calories. 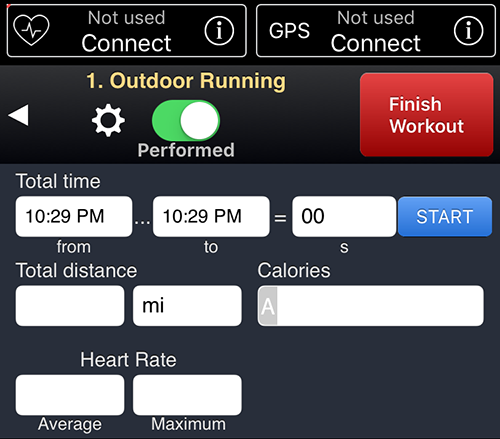 The start time and duration are required to pull the correct heart rate and location data if you use these features. Heart Rate – You can connect your BlueTooth 4 (LE) heart rate monitor (top-left screen corner) to record your heart rate graph and automatically calculate your average and maximum heart rate. GPS – You can activate it to save the map of your run or other outdoor activity and to automatically calculate the distance, speed and pace. Note A inside Calories entry field. It stands for “automatic” - GymGoal will calculate calories automatically. When you connect your heart rate monitor, A appears inside the Heart Rate entry fields. When you activate GPS, A appears inside Distance entry field. You can tap inside an automatic entry field and enter your number – GymGoal will stop calculating it. If you want to remove your number and resume the automatic calculation, enter 0. When heart rate is monitored, the button to connect it is replaced with a small graph. Tap this graph to select your target zone, and GymGoal will alert you when your heart rate leaves this zone. Your cardio workouts will be more efficient if your heart rate stays in the zone that is the best for your goal. In Weight Management zone, for example, up to 85% of burned calories are "fat" calories. When GPS is active, the button shows your current speed and a picture of a map. This map is just a generic picture, it is not the actual map of your run. Tap this picture to open the real map.